First of all, you should choose a suitable location for the bathroom, as it is best to arrange it in the Northern part of the apartment. This is due to the fact that the North always has a close relationship with the water element. Check out the bathroom should be so that the interior was simple and well lit. Many people prefer to place a mirror should hang on the wall. The main thing that it was located opposite the doorway, because such a principle will help to avoid stagnation of positive energy flow. 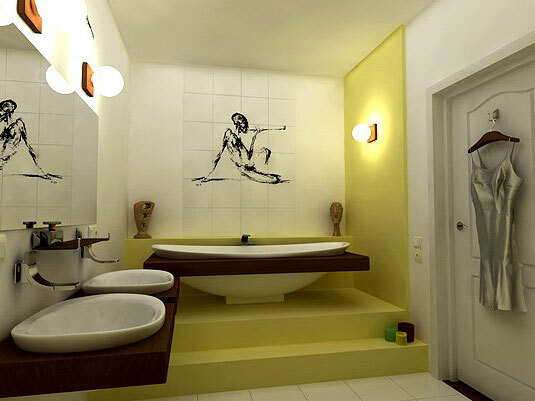 Bathroom design must be completed in blue or green color, it is also possible to choose a pastel tone. All these shades are in perfect harmony with the water. Everyone knows that the fire element can't be friends with water, so the design should abandon the yellow and orange tones. These colors always characterized by fiery energy. Another important point is the location on the wall surface tile mosaics, depicting fish and various marine landscapes. This decision will help make the room more beautiful, and its design will meet all the recommendations of Feng Shui. Also pay special attention to the interior in the room. Here it is necessary to place everything in its place, as only in this case will be able to create a fresh and clean interior. Do not be put in a prominent place different gels, shampoos and other toiletries. It is best to place them in a special hanging cupboard, which is made in a bright tone. With a large number of small elements you can never count on obtaining homogeneity of the water element. It is important to remember that water can have a strong impact on certain vital aspects. Most often these include the success on the career ladder and prosperous life. Power of water nourishes your luck and therefore it is not necessary to place in the bathroom, potted plants or a toilet for a pet. You need to ensure that the toilet lid was always closed, otherwise it will indicate the leak not only money, but also forces. In the bathroom constantly pouring a lot of water, so Feng Shui recommends that you place a mirror on the surface of the door. It can be used to reflect the energy flows and they will be stored indoors. If you perform all the tips, this will help to maintain the financial situation and, of course, power. True if the tap continues to leak, it is best just to do it.